A valley is term used for the roof where two sections of a building meet at an angle. A building which is L shaped will have one valley whereas a building which is T shaped will have two. Valleys are a channel for water and their construction needs to acknowledge this. Due to the amount of water which travels down a valley the construction has, over the years, varied. The larger the roof area feeding the water to the valley, the more the valley has potential to wear. Some valleys are thatched and it important that the thatch is applied very tightly. 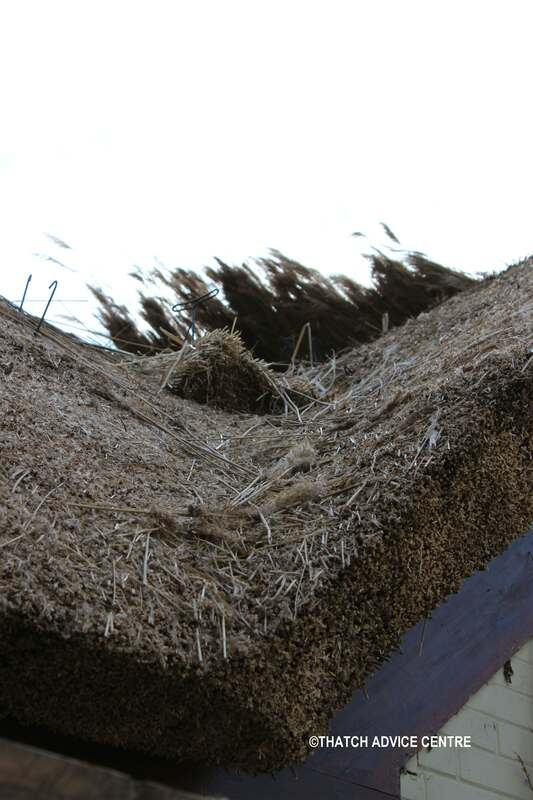 The way it is formed it will create a slightly thicker thatch but it is the way it thatched which will make it last, not the thickness. Some thatched properties may have a tiled valley with a thatched barge either side. A lead valley is similar to a tiled one. The construction of valley is where a lay board is placed on the main roof where the valley will be. The jack-rafters go into this lay board and the roof is then constructed at right angles to this. The pitch, as with all thatch, should be a minimum 45’ , the steeper the better. Usually a double rafter is placed where the ridge board from the valley roof joins to give strength to the construction.